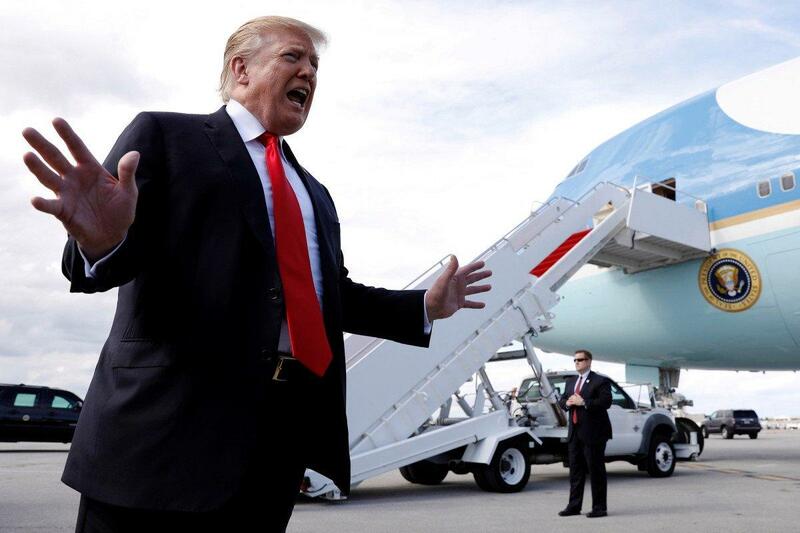 Update 145pmET: President Trump has called for an investigation into the "illegal takedown that failed" - after Special Counsel Robert Mueller found that Trump and his campaign did not collude with Russia in the 2016 US election. "It was just announced, there was no collusion with Russia. The most ridiculous thing i've ever heard. There was no collusion with Russia. There was no obstruction. None whatsoever. It was a complete and total exoneration," Trump told reporters. "It's a shame that our country had to go through this. To be honest it's a shame that your president had to go through this for - before I even got elected, it began. And it began illegally. And hopefully somebody is gonna look at the other side. This was an illegal takedown that failed, and hopefully somebody is going to be looking at the other side." Recall that Hillary Clinton's campaign paid an opposition research firm, Fusion GPS - who paid a former UK spy, Christopher Steele, who compiled a bogus dossier using Kremlin sources, which was then used against Trump both at the federal level and in court of public opinion. Also recall that Maltese professor (and self-admitted Clinton foundation member) Joseph Mifsud seeded Trump aide George Papadopoulos with the rumor that Russia had "dirt" on Hillary Clinton. Papadopoulos would later drunkenly pass this information to Australian diplomat (and Clinton ally) Alexander Downer, whose report reached the FBI and launched operation crossfire hurricane. The FBI would then employ at least one spy to "infiltrate" (spy on) the Trump campaign. Will a second special counsel be created to investigate "the other side" - now that the 'plot' has been exposed and Trump vindicated of collusion? "In light of the very concerning discrepancies and final decision making at the Justice Department following the Special Counsel report, where Mueller did not exonerate the President, we will be calling Attorney General Barr in to testify before the House Judiciary Committee..."
"It's a complete exoneration of the president. It's quite clear - no collusion -which kind of raises the question why did this all start in the first place? " As we detailed earlier, lawmakers on Capitol Hill have received a four-page letter from Attorney General William Barr which concludes that "The Special Counsel's investigation did not find that the Trump campaign or anyone associated with it conspired or coordinated with Russia in its efforts to influence the 2016 Presidential election." Of course, Rep. Jerry Nadler (D-NY) - who chairs the House Judiciary Committee (and has already fired up the post-Mueller "witch hunt") notes that "while this report does not conclude that the President committed a crime, it also does not exonerate him." As far as Obstruction - Mueller has left it to the Attorney General to "determine whether the conduct described in the report constitutes a crime." Except - Barr sees no obstruction - writing in conjunction with Deputy Attorney General Rod Rosenstein that they "concluded that the evidence developed during the Special Counsel’s investigation is not sufficient to establish that the President committed an obstruction-of-justice offense." Mueller's team of approximately 40 FBI agents issued over 2,800 subpoenas, executed "nearly 500 search warrants," and "obtained over 230 orders for communication records. They also issued 13 requests to foreign governments for evidence and interviewed approximately 500 witnesses. ... found zero evidence of "collusion" and AG says the "report identifies no actions that in our judgement constitutes obstructive conduct." Needless to say, conservatives are considering this a yuge win. The summary of Mueller’s report released by Barr is a stunning rebuke of propaganda that the Democratic Party pushed for the past two years with their media friends at @CNN @nytimes @MSNBC & @washingtonpost. President @realDonaldTrump was right all along, there was NO COLLUSION! 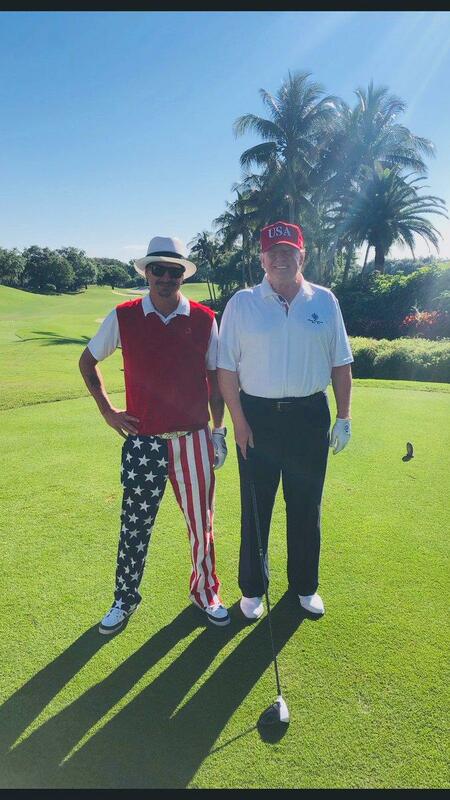 While the full report could include damaging elements which don't rise to the level of criminal charges, Trump is certainly projecting the "all clear," tweeting on Sunday "Good Morning, Have A Great Day" - after hitting the links with musician Kid Rock on Saturday at Trump International Golf Club. Both Democrats and Republicans have called for the full public release of the long-awaited report, which notably did not include any new indictments - sending Democrats into fits over the weekend as Republicans celebrated what appears to be a big win. On Saturday, 18 state attorneys general joined together to urge the Justice Department to publicly release the final report. "As the top law officers in states across the country, we strongly urge United States Attorney General Barr to immediately make public the findings of the Mueller investigation," reads the statement. "The American people deserve to know the truth." 17 AGs have joined our call to urge US Attorney General William Barr to release the Mueller report to the public. It's likely that Democrats want to see the entire report in order to pick up on any wrongdoing that may have occurred, yet did not rise to the level of a chargeable offense. Reason for Republicans not to celebrate: Mueller report could include evidence that many voters would find damning but still conclude it was unlikely prosecutors could convince a jury of guilt beyond a reasonable doubt. Therefore, no further action. While Mueller apparently did not find anything else that rose to the level of a prosecutable crime (or has handed off aspects of the investigation to federal prosecutors), journalist Paul Sperry notes that the Special Counsel investigation also failed to yield any indictments on the left. Democrats, meanwhile, are still holding out for the "fat lady" to sing based on the notion that aspects of the investigation were handed over to New York prosecutors. The only question - where will the left move the goal posts when this is all said and done?